Yes, it ended a week ago but we needed some time to recover reflect. Seasoned festivalgoer and occasional MostlyFilm arts correspondent Lissy Lovett shares her experience of this year’s Glasto. I love the Glastonbury Festival. I first went in 2005 and, this is no exaggeration, it changed my life. I started a business because of what I was inspired by there and I think I might, just, behave a bit more kindly to my fellow woman each time I come back. This is what I did and saw this year. Glastonbury is massive. 135,000 people go there each year, plus at least 40,000 workers, and it covers 900 acres. It’s impossible for one person to see it all and I certainly never manage it. Not only did I miss 99% of the excellent acts, there were whole areas that I never even set foot in. I’ve had great times in the Green Fields and at the Acoustic and John Peel stages in the past: I didn’t even see them this year. Every year I come home, watch the BBC coverage, and it bears little to no resemblance to the festival I was at. Added to this, I know that the mood that I’m personally in affects my enjoyment and appreciation of music very much and I’m constantly in a brilliant mood at Glastonbury. And I’m mostly a bit drunk. So, what follows is a very very subjective review. The first thing to note about Glastonbury, particularly when compared with other big festivals, is that it’s a very very nice place to be. When you come through the gates everyone checking your ticket and giving you a wristband appears to be happy to see you and want you to be there. And once you’re in, you’re in. There’s no traipsing between a campsite and an arena with your wristband being checked each time, and no one is going to stop you taking a few cans to see a main act. Did I mention I love Glastonbury? I love Glastonbury. But to the acts! My Glastonbury this year was dominated by female-led acts, with a bit of added Metallica and Keith Allen. Quite a bizarre mix. Let’s start with the women. We kicked off Thursday with Kate Tempest, who gave a hugely committed fun performance in the Rum Shack in The Common field, where she coped brilliantly with a few technical issues (and goodness knows organising all the technology at the festival cannot be easy; I blame no-one for this). She’ll definitely be going on my Spotify playlist. Later on in the weekend I was really excited to catch the Plastic Ono Band at the Park Stage. Yoko Ono is brilliantly eccentrix, and I loved her commitment to her psychedelic-tinged 70s rock and her unique style of vocals. She was followed by St Vincent with their hugely choreographed performance, which at times is more performance art than gig, although I think I will still enjoy their tunes even when I can’t see them. Dolly Parton on Sunday was the highlight of the festival for me and many others. It was the one performance that everyone I spoke to said they’d be going to see and I wonder a little bit why she wasn’t the Sunday headliner. Goodness she’s a classy lady; so happy to be there, so professional and such good tunes. Whenever I’m in doubt about what I should do in life in the future, I will just think “What would Dolly do?” and do that. Elsewhere over the weekend we saw Hazel O’Connor, who has the most lovely voice and I think I could listen to her forever, even if she will insist on doing Snow Patrol covers. M.I.A. headlined the West Holts stage on the Friday, and was unapologetically in-your-face. I’m watching some of her set back on iPlayer as I type this, and apart from anything else it’s brilliant to see a woman in the music industry wearing some actual clothes instead of singing in her underwear. Somehow or other I didn’t see too many performances on Saturday: I’m not quite sure how that happened. I certainly seemed to be having a very good time. But in the evening I really enjoyed Metallica. Give me a bit of overblown American heavy metal on a Saturday night any day over some introspective British indie boys. They were committed, enjoyed themselves, and contrary to what I’d previously understood seemed to be very good at playing their instruments. Goodness knows, I’d probably never choose to listen to that style of music when I’m walking to the bus stop but I really enjoyed it at the time, and they did it very very well. It’s a small thing I know, but they left very little silence between their songs, which kept the mood going brilliantly. I wish a few other bands (Massive Attack, I’m looking at you) would do the same. Over the weekend we also saw Keith Allen’s band a couple of times, not because of any particular love of geezers, but because a friend of a friend is in the band. 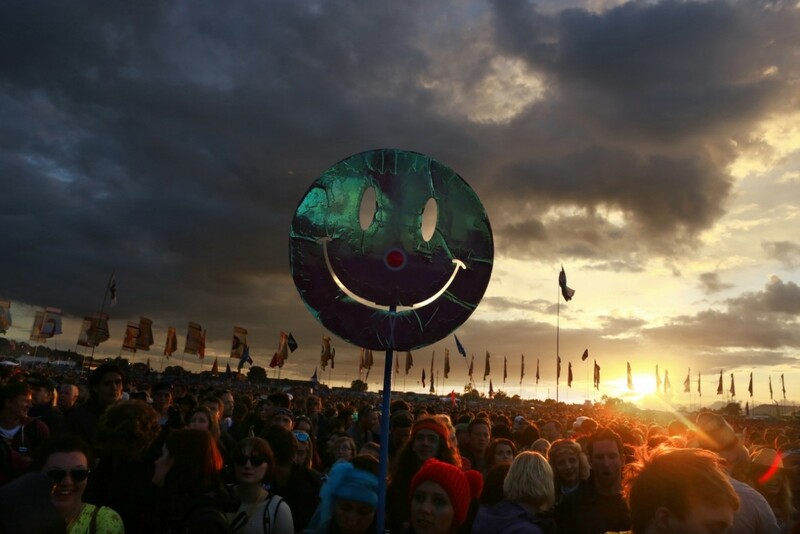 But in many ways they represent what’s brilliant about Glastonbury: all human life is there. The amazing stuff, the off-the-wall stuff, and also sometimes the middle-of-the-road stuff. For almost the first time ever I spent some time in the Dance Field, now known as Silver Hayes, and I’m really glad I did. We expected to find wide-eyed folks dancing wildly wearing fake-fur leg-warmers, and although there was a bit of that, and more power to them, there was also Fatboy Slim, dancehall, and the Sultan Of The Disco who were a brilliant closer for our Sunday night. Glastonbury’s about more than just the music, it’s also about the atmosphere and the extra thought that goes into designing and decorating the site. There are beautiful corners everywhere you look, and late at night you might find yourself having a drink behind a waterfall, dancing like a maniac in the Silent Disco, or talking absolute rubbish to your friends in the late-night mayhem that surrounds the stone circle at the top of the site. Glastonbury manages to combine the size and big acts of the other larger festivals, whilst retaining the friendliness and uniqueness of some of the the smaller festivals, and that’s no mean trick to pull off. Of course Glastonbury isn’t perfect. It’s still a very white festival, a few people really don’t tidy up after themselves very well, and although the access for disabled festival-goers might be better than most there’s still a subtitled-sized gap next to all the stages which could be sorted out. But, it’s still the best party I’ve ever been to, and although it might make competition for tickets even worse, if you’ve not been do give it a go next year. It might change your life. Lissy Lovett tweets as @lissylovett and likes her friends, beer and walking boots. You can register for information on ticket availability for the 2015 festival at the official website.